This is another little visitor I immensely enjoy but who only comes around sporadically. I have no idea if it is a male or female. She stops in so briefly and darts around so quickly, I have very few good photos of her. I've been using on my iPad/iPhone. It's got some pretty awesome tools! more friends around as spring comes about. to raise her family in my backyard?? Don't you just love her little upright tail! Also, I so enjoyed all your comments on your most unique visitors. Have an awesome upcoming weekend, my friends! Pretty little bird and great pics! i adore these little sprites, too. i've hung a wren house or two and they've never used them. prefer to nest in the garage in old pvc pipe sections or even the dog pooper-scooper. Such beautiful, delightful little birds and I think you got some terrific shots! I, too, love her upright tail! Hope your have a wonderful weekend, Reena! HI Reena...The sweetest little birds that I get to see only in the warmer months...but they do use my birdhouses, and fill them to the top with sticks until they have the right one lol!! I love the wren....pert, lightning quick, beautiful. great capture and phot edits. She is adorable, Reena, and the first thing I noticed was that sweet little tail! I noticed some of these when we had snow around Christmas. They are cuties, but very skittish. We have a few carolina wrens too and they have such a beautiful song. Love the overall "glow" look to the shots! Nice! I call them the opera singers of the songbirds! They have such a big voice for such a little bitty bird! We usually only have one little wren and she typically lays her eggs in a flower pot that has lots of greenery in it! I didn't even know she had a nest in that pot until one day when I was watering it and out she flew practically right in my face! You should have seen how high I jumped! Love that new app you found. You took these photos with an iPad or iPhone? Great! I like that app....it suits that little wren so well. 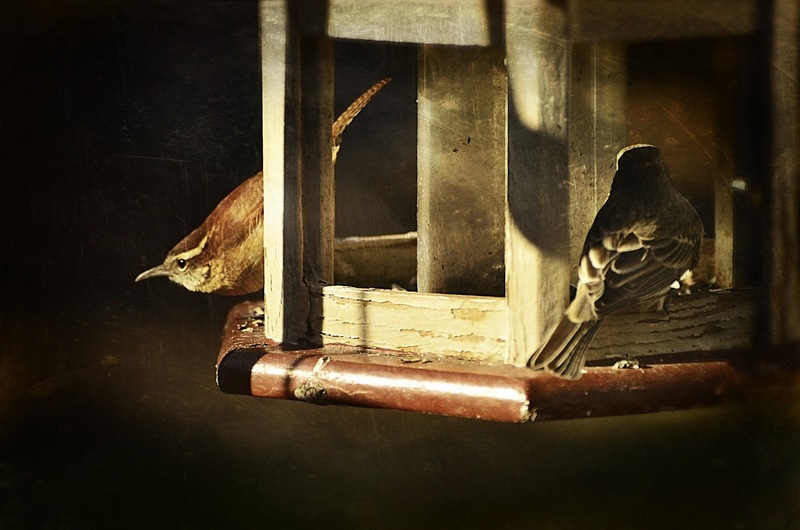 Reena, these are adorable photos of the Carolina Wren! Such a cutie! Wonderful Wren shots!!!!! Tricky birds to capture:) Very cute! I do love her little tail and your captures of her/him are timeless. So so sweet. Oh, the wrens are so cute!!! Hope you actually have a pair of them around. Sometimes it can be difficult to tell whether one or two but keep your eyes open. There's a pair that lives here around my yard and I love them. The wrens are among my favorites. They are very swift, though, and hard to capture. You did great! 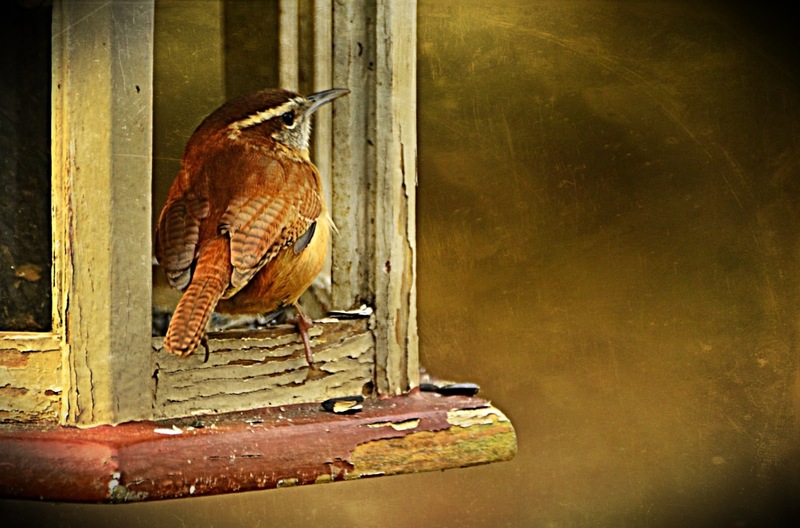 Your pictures are just amazing, and the wren is one of my favorites too--Especially when they are flying away with a little peanut I've put out, they are so cute! Love these Wren photos which look like watercolors - must look at "Toaster!" 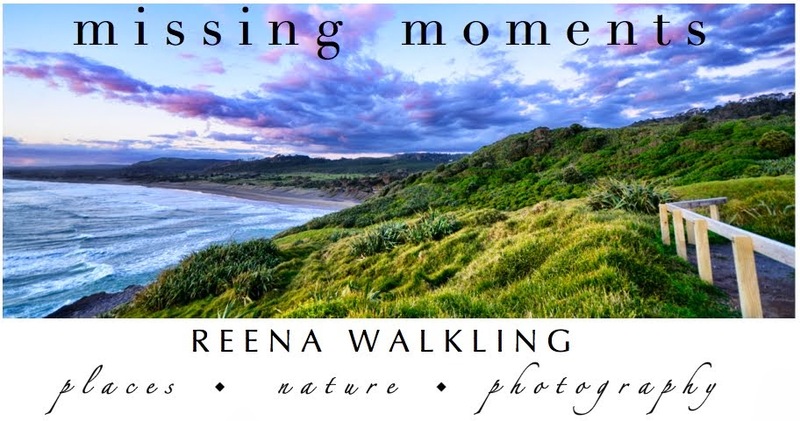 Great photos, Reena! I especially like the last one! 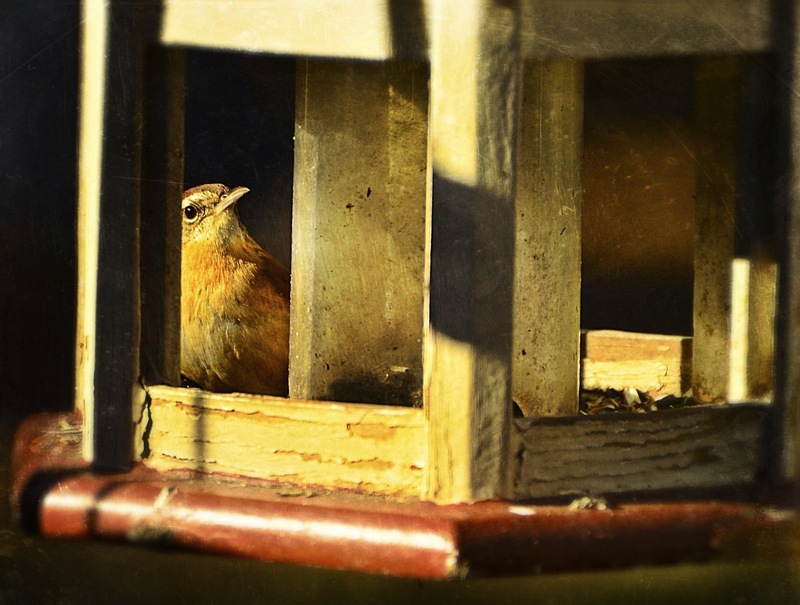 Charming bird shots - love the lighting! Great shots! I particular like the last 2 photos. The lines and the light of the third one make it really interesting. Very nice work. I saw my first wren last summer at my mom's. They really are adorable. And yes, their tails are the cutest! A delightful little visitor..I just make sure there is always water in the birdbaths , wild bird birdseed in the trays and grow bushes like Geraldton Wax which they love..seems to do the trick.. I love the light in the first three images. Such a sweet little bird. How lovely to nurture your little friends so you can get such delightful images, Reena! I love these busy little birds! oh boy ... an iPhone and iPad .. all yours or are you sharing with the Prof???? Ah! she's just such a cute little sweet bird .... if I were an artist I'd love to paint her. Thanks for the info about Photo-Toaster Reena .... I work a lot from my ipad so can't wait to take a look at it. Your new app is working, don't know what you did to the photos but they are awesome. these photos are a delight! What a sweet beauty..and I love that exquisite light! That tail is just too cute. You always manage to capture their personalities so well! The pictures with the dark background look taken inside a studio. suggestions for getting them to raise their family in your backyard? - I don't know, free healthcare? What a cutie. And Yes I do love that cute little tail..
because they do flit around in the underbrush so often.